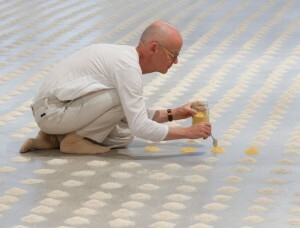 Wolfgang Laib (born March 25, 1950) is a conceptual artist who works with mostly natural materials. After studying medicine in the early 1970’s with a dissertation on the cleanliness of drinking water, he turned his focus to his interests in Art, Zen Buddhism and Taoism. Laib’s work is often grouped with Land Art and Process Art with a huge emphasis of minimalist influences. He works with notable materials such as pollen, marble, rice, beeswax and milk. He started making milkstones in 1975. These works consist of a rectangular marble brick. The top surface is sanded to create an almost unnoticeable embossing. The impression is filled with milk, creating the illusion of a solid object where the viewer doesn’t notice the material being both liquid and solid – it is seen as one material. Laib later turned to works made up of large quantities of yellow pollen which he has become most associated with. These works involve a slow and intense process of collecting his own pollen near his home in Germany. Each pollen is unique in color and size. The pollen works are also exhibited in glass jars or small piles. In addition, the pollen is sold to collectors and institutions in glass jars, without any stipulations as to how it should be exhibited. The idea being the pollen is the artwork, not the process of collecting it or presenting it sifted on the floor or in jars.